High Performance Computing (HPC) is at the core of major advances and innovation in the digital age. In the massively connected digital economy, the exponential growth of data, networking and computing will continue to drive societal changes, scientific advances and productivity gains. The nature of computing is changing with an increasing number of data-intensive critical applications, and the intertwining of HPC with a growing number of industrial applications and scientific domains makes HPC the engine to power the new global digital economy, improving the scientific and industrial innovation capability and the competitiveness of industries and SMEs, allowing better services for the citizens and better decision making. HPC is one of the key contributors to the Digital Single Market (DSM) strategy next to Cloud services, Big Data and Internet of things (IoT). Europe is leader in the use of HPC-powered applications: the users of HPC systems and applications in Europe include the most profitable and vibrant industrial sectors such as manufacturing, oil&gas, or pharmaceutical. HPC has excellent returns-on-investment (ROI) in Europe: for projects with financial returns, each euro invested in HPC on average returned €867 in increased revenue/income and €69 in profits. HPC and Big Data enable traditional computational-intensive sectors to be more productive and move up into higher value products and services like smart manufacturing (e.g. simulation allows fast prototyping, with huge savings in the development of faster and safer cars and planes). These technologies also pave the way for new science, business and applications that we are far from imagining now. New applications and services are emerging based on the convergence of HPC, Big Data and Cloud –for example connected autonomous vehicles-, and novel access and deliver methods (e.g. the "cloudification" of data and HPC resources) will allow the "democratisation" of HPC, putting this wealth of data and computing within the reach of business, SMEs and researchers. Mastering HPC technologies has become indispensable for supporting policy making, maintaining national sovereignty and economic competitiveness. The development of the next HPC generation (i.e. the exascale computing) has become a national strategic priority for the most powerful nations, including U.S.A., China, Japan, Russia, and India. However, no single Member State has the means to compete effectively in HPC at a global scale. Regarding the implementation of the Action Plan for the European HPC Strategy outlined in the Commission's Communication "High-Performance Computing: Europe's place in a global race", and the overall objective of European leadership in HPC by 2020, there has been impressive progress in crucial areas, especially organising the European HPC community to pursue HPC leadership on a coordinated basis, expanding the scientific and industrial access to supercomputers (e.g. PRACE), and launching initiatives to strengthen the European HPC supply chain (i.e. the contractual Public-Private Partnership on HPC). Europe's standing as a provider of high-end supercomputing resources advanced in both absolute and relative (worldwide) terms during the period 2010-2015, narrowing the former gap with U.S.A., Chinese and Japanese supercomputers. On average the net funding increase in HPC over 2010-2014 was extremely good for pursuing HPC leadership. However, the EU is losing its position in the top supercomputing league. There is no European-wide strategy to coordinate the national investments in the segment of strategic HPC systems. The EU today has only one supercomputer in the top 10 and three in the top 20, dropping from 4 and 7 systems respectively in 2012. Significant additional investments will be needed for Europe to stay in the HPC race: current estimates of public and private investments for Europe to achieve leadership by 2020 are in the order of additional €3.263 billion in 5 years (2016 to 2020) or €5.271 billion in 7 years (2016 to 2022) in order to match the developments of Europe's main competitors for HPC leadership. Member States and the EC will need to find a way to pool financial resources and coordinate their investments. The governance of HPC has considerably evolved in the last few years, creating a real awareness of the importance of HPC for Europe and of the need to efficiently coordinate, pool and use available HPC resources at EU-level. The most significant HPC actors in Europe in the field of Research and Innovation (mainly PRACE and ETP4HPC) are joining forces with other players to coordinate the strategy of the European HPC ecosystem. Further coordination is also necessary between the different national HPC policies and the European strategy. A longer-term step in this strategy is to integrate HPC as a key component in the innovation environment of the European Science Cloud. The development of the HPC ecosystem requires the joint effort of the supply and demand sides. The EU is positioned to manage and coordinate a strong base of both indigenous and foreign technology to assemble exascale HPC capability that could, in some critical application sectors, achieve world-class, if not global leadership, status; for example in areas such as transport, aerospace, climate and weather, or the bio-economy. The next steps in the European HPC strategy are the large-scale platform integration of the technology building blocks with a co-design approach (choosing and developing technologies fitting the real needs of important European HPC users and applications). This needs to be complemented with the coordinated acquisition at EU level of world-class systems in order to transition the European leading supercomputers to the new computing generation, and with the further integration of the European HPC infrastructure. The new opportunities offered by the convergence of HPC, Big Data and Cloud have to be exploited for wide spreading and easing HPC use. For example, platforms for on-demand HPC-empowered Cloud services can facilitate access to the new generation of Big Data tools and services such as high performance data analytics to SME’s, start up’s and company departments, or researchers in the European Science Cloud. Regarding industrial access to HPC, considerable progress took place in the last few years. Several Member States continued or set up new HPC competence centres that facilitate access of industry and specifically SMEs to HPC services, with supercomputing centres giving support and transfer expertise to them. However, greater outreach is needed to make HPC resources and software available to industry, especially SMEs. Stronger support is needed for disseminating to a much broader industrial base and easing the access to innovative European HPC applications and codes that are currently in limited use. A critical component of the strategy is to develop a much larger workforce that is well educated and trained in HPC. There is still a shortage of qualified HPC job applicants, as HPC is not always part of university curricula in Europe. It is crucial to promote the HPC skills and educational needs from a multidisciplinary point of view, intertwines both the computational and the domain-specific aspects, and to explore new training programmes that exploit the combination of a wider base of Web-programming skills with cloud-based access to HPC resources. More importantly, industry actors need to be encouraged to provide initial and on the job training for staff to address gaps that universities are, given the pace of change, not necessarily able to address. Regarding fair access to HPC markets, the protective barriers of the main HPC world-competitors (U.S.A., Japan and China) are still in place –by contrast, the EU is the most open market both for commercial and government procurements. In February 2012, the Commission adopted the Communication "High-Performance Computing: Europe's place in a global race" 1 . This Communication highlighted the strategic nature of High-Performance Computing (HPC) as a crucial asset for the EU's innovation capacity, and called on Member States, industry and the scientific communities, in cooperation with the Commission, to step up joint efforts to ensure European leadership in the supply and use of HPC systems and services by 2020. The Communication outlined the EU strategy on HPC with an Action Plan towards the overall goal of European leadership, indicating that the implementation of this Action Plan would be reported to European Parliament and Council by 2015. In this document, the Communication will be referred to as "HPC Communication", and the EU strategy on HPC as "European HPC strategy". The Competitiveness Council on May 2013 adopted conclusions 2 on the HPC Communication, highlighting the role of HPC in the EU's innovation capacity and stressing its strategic importance to the EU's industrial and scientific capabilities, and as well as to its citizens. These conclusions invite Commission to report to the Council on progress made in the plans for HPC before the end of 2015. This document is a European Commission staff working document for information purposes. It does not represent an official position of the Commission on this issue, nor does it anticipate such a position. High Performance Computing (HPC) mainly refers in this document to the use of powerful supercomputers 3 to solve complex computational problems, as a synonym for high-end computing, supercomputing, world-class computing, etc., but the term HPC is also used for a large number of systems that cover all technical servers that are used for highly computational or data intensive tasks by scientists, engineers, financial analysts and others 4 . HPC may be carried out on premise in dedicated HPC data centres, or in private, public or hybrid cloud environments. HPC methodologies include modelling and simulation, advanced data analytics, visualization, and others. The fastest machines are currently running in the order of a few dozen petaflops, i.e. a petaflop is 1015 (one thousand million million) floating point operations per second (flop). The next frontier is the exascale computing, several hundred times faster than current machines (1018 or 1 million million million flops). Computing is at the core of major advances and innovation in the digital age, providing us with a better living environment and shaping our social habits, from the Internet to consumer electronics, transportation to manufacturing, medicine, energy, and scientific applications. This digital innovation force is increasingly predicated on our ability to process large amounts of data and carry out complex computations. And this ability relies on the enormous opportunities for innovation and change created by major ICT developments that have not been matched by any other area of technology, e.g. the mobile phone, a device that did not exist 20 years ago. The ICT revolution is not over yet. In the next few years, the exascale computing frontier will be reached, and faster custom processors will power our every-day devices. A mid-’70s Cray supercomputer was capable of performing 80 million operations per second, while the graphics-processing unit in an iPhone 5S is nearly 1,000 times more powerful. In the Internet of Things (IoT) 4.9 billion 5 connected things will be in use in 2015, up 30 percent from 2014, and will reach 25 billion by 2020. Global IP traffic has increased fivefold over the past five years, and will increase threefold over the next five years. Annual global IP traffic 6 will pass the zettabyte (1021 bytes or 1000 exabytes) threshold by 2016, and will reach 2 zettabytes per year by 2019, or 168 exabytes per month. From 2005 to 2020, the digital universe will grow 7 by a factor of 300. It is expected that by 2018, 4.5 billion smartphones and 2.5 billion social networks users will be connected. From 2012 until 2020, the digital universe (a measure of all the digital data created, replicated, and consumed in a single year) will about double every two years, jumping from 130 exabytes in 2005 to 40 zettabytes by 2020 (more than 5,200 gigabytes for every man, woman, and child in 2020). HPC is the engine to power the new global digital economy. The nature of computing is changing with an increasing number of data-intensive critical applications. The convergence of HPC, Big Data and Cloud will ease the access to a wealth of data and computing power enabling new applications and software. Mastering HPC technologies is vital for Europe's innovation capabilities in science, industry and society. The convergence of HPC, Big Data and Cloud will allow new applications and services to the citizen to emerge. The exponential growth of data, networking and computing will continue to be a key driver of societal changes, scientific advances and productivity gains across the economy, bringing IT muscle to industry (in particular SMEs), allowing ground breaking innovation, with profound effects on society, science and business. New access and deliver methods will allow the "democratisation of HPC"; easier access to the computing power of HPC and the accompanying software and tools to process and analyse Big Data will be key for scientific and industrial innovation; for example, the "cloudification" of HPC resources and simulation and software analytics tools will allow a much larger number of SMEs without in-house capabilities to produce better products and services, or a cloud-based HPC and data e-infrastructure for researchers to easily harness huge computing capabilities and an increasingly wealth of open raw data and information (Open Science Cloud). The intertwining of HPC with a growing number of industrial applications and scientific domains makes HPC the engine to power the new global digital economy. HPC has to be considered in a multidisciplinary way, as computational aspects will be increasingly integrated in training, skill development and education curricula of many different areas e.g. in bio-chemistry, pharmacology, engineering, entertaining, financing. These developments are in line with one of the Commission's priorities, the Digital Single Market (DSM) strategy 8 . HPC is one of its key contributors next to Cloud services, Big Data and Internet of things (IoT). The connected car is already on the market and generating significant revenue for car makers and tech companies. By 2020, there will be a quarter billion connected vehicles on the road, enabling new in-vehicle services and automated driving capabilities.5 Connected cars will be built with the necessary hardware to allow people to access cloud services like sophisticated infotainment applications, traffic and weather alerts, and always-available, contextual, predictive navigation. The services industries will also use HPC to cope with the enormous amount of information produced by the vehicles, such as real-time traffic management or predictive maintenance. New economic value chains emerge from HPC-powered analysis of Big Data. PayPal, a multibillion-dollar eBay company, has integrated HPC servers and storage into its datacentre workflow for sophisticated fraud detection on eBay and Skype transactions in real time before it hits credit cards. IDC estimates that using HPC has allowed PayPal to save more than €500 million to date. Mastering HPC technologies is therefore vital for Europe's innovation capabilities in science, industry and society. The Council highlighted2 in its conclusions on the HPC Communication that HPC is an important asset for the EU's innovation capacity and stressed its strategic importance to the EU's industrial and scientific capabilities as well as its citizens. In the global digital economy, to out-compute is to out-compete. HPC and Big Data will drive major advances and innovation in the upcoming global digital economy, enabling traditional computational-intensive sectors to move up into higher value products and services and a vast range of new applications. New HPC delivery and usage models will be developed to harness huge computing power and memory capacity and put within the reach of business, SMEs and researchers, e.g. via HPC-empowered Clouds. Europe is leader in the use of HPC-powered applications: the users of HPC systems and applications in Europe include the most profitable and vibrant industrial sectors, e.g. manufacturing - €6,500 billion of GDP and 30 million jobs, oil & gas - €440 billion of GDP and 170000 jobs, pharmaceutical industry - €800 billion of GDP and 40% of worldwide market share and medicine - €1,000 billion of public spending. HPC and Big Data enable traditional computational-intensive sectors to move up into higher value products and services, like smart manufacturing. The new manufacturing and production processes of Industry 4.0 12 will use HPC to become more productive, efficient and more adaptable to meet specific customer needs; and to handle the increasing complexity of decentralised networked intelligence of the new industrial facilities. HPC-based cloud, simulation and data analysis make possible the new on-demand integration for business-to-business (B2B), for example big manufacturers with thousands of smaller trading partners and suppliers are able to virtually customise and test their products rather than using a costly traditional production-line validation process. In addition, data, modelling and simulation pave the way for new science, business and applications that we are far from imagining now, e.g. personalised medical diagnosis and treatment, cosmetics, food security, sustainable agriculture, bio-economy, accurate global climate models, etc. bringing enormous social and economic benefits. Manufacturing contributed about 30 million jobs and 16% of EU GDP (€6,500 billion) in 2013, and the European Commission aims to increase that figure to 20% by 2020. 13 Manufacturing represents two-thirds of EU exports and two-thirds of EU private-sector R&I investment but Europe lost seven million manufacturing jobs between 2000 and 2013. 14 HPC enables smart manufacturing that could create new manufacturing jobs and return some lost manufacturing jobs to Europe. HPC has enabled European automakers to increase productivity by reducing the time for the development of new vehicle platforms from an average 60 months to 24 months while greatly improving safety (so reducing fatalities), environmental friendliness, and passenger comfort. HPC is critical for this innovation wave in the car industry, allowing the fast exploration of new technical solution needed to optimize the product and reducing the number of iterations to design and validate a connected and autonomous vehicle in a complex internal and external environment where a huge amount of data is produced by the car and processed by it. Europe spent about €450 million on the HPC ecosystem for manufacturing in 2013 and will spend about €638 million in this sector in 2018Error! Bookmark not defined.. A substantial, growing portion of this spending is by manufacturing SMEs, who, like larger manufacturing firms, employ HPC to accelerate innovation. New HPC delivery and usage models will be developed to harness huge computing power and memory capacity and put within the reach of business, SMEs and researchers, e.g. via HPC-empowered Clouds. For industry and in particular for SMEs, available and easy-to-use HPC resources is a priority for their competitiveness and for better adaptation to market demands especially in terms of innovation and fast renewal of their product and service offerings –this is one of the main objectives of Industry 4.0. The European initiative I4MS 17 (ICT Innovation for Manufacturing SMEs) in Horizon 2020 LEIT/ICT promotes HPC Cloud-based modelling, simulation and analytics services for integrating multiple tools across the process chain, for exploiting the dynamic availability of "big data" and for integrating novel mobile interfaces for data management and decision support. One of the I4MS projects (Fortissimo) aims to make European industry more competitive globally, by making simulation services accessible to industrial users, particularly SMEs, via a one-stop-shop HPC-based cloud infrastructure. The health sector represents 10% of EU GDP and 8% of the EU workforce. 18 The pharmaceutical industry alone contributes €800 billion to Europe's GDP. Biology is fast becoming a digital science, and HPC is increasingly important for advanced medical research, biomedicine, bioinformatics, epidemiology, and personalized medicine—including "Big Data" aspects. Europe spent about €416 million on the HPC ecosystem for bio-life sciences in 2013 and will spend about €510 million in this sector in 2018.Error! Bookmark not defined. Scientific computing has enabled a revolution in all scientific disciplines and today is the “third pillar of science”. HPC is a key element of the innovation environment for the data-driven science in the European Science Cloud. Over the last 20 years, the computational capability of the world’s fastest computers has increased by a factor of over a million in that time. This has paved the way for a revolution in the way science is carried out. All scientific disciplines are becoming today "computational". Scientific computing is often called the “third pillar of science”, standing right next to theoretical analysis and experiments for scientific discovery. HPC has become a fundamental tool for scientific discoveries and innovation, because of its increasing capability to model, simulate and to process data. The Nobel Prize Chemistry 2013 21 was awarded for "the development of multi-scale models for complex chemical systems". The quantum theoretical calculations needed to simulate chemical reactions require a huge amount of computational power. Nobel Prize winners (Karplus, Levitt and Warshel) developed computer models that could apply quantum and classical calculations to different parts of a single molecule. the problem would be too expensive or time-consuming to try to solve by other avenues, e.g. determination of the structure of proteins. HPC simulation is also an important alternative for animal testing. The social and economic costs of experimental ("live") science and engineering research on animals have skyrocketed in the past decade. This has made HPC increasingly attractive from a social and financial point of view. The REACH Regulation issued in 2006, the 7th Amendment of 2003 of the European Cosmetics Directive and the new European Regulation on cosmetic products issued in 2009 created an unprecedented need for alternatives to animal testing in Europe. On March 2013 a full ban on the marketing of cosmetics products tested on animals entered into force in the EU. This heavily triggered the development of alternative testing methods to reduce to a minimum the need for animal testing and, in the case of cosmetics, to fully substitute them. The NOTOX project 22 , co-funded by the European Commission and Cosmetics Europe (the European trade association of the cosmetics industry), significantly contributes to this endeavour by developing and validating predictive bioinformatics models characterizing long-term toxicity responses. Scientific advances require an increasing computing power reaching exascale capacity. For example, "Understanding the human" requires sophisticated computational models that push the boundaries of supercomputing and Big Data. The Human Brain Project (HBP) 23 is pushing the boundaries of supercomputing. The hardware, software and data infrastructure required to run cellular brain model simulations up to the size of a full human brain require exascale capabilities in computing power and in storage and data handling, but also advanced features (some of them not fully available today) such as tightly integrated visualization, analytics and simulation, efficient data management, dynamic resource management for co-scheduling of heterogeneous resources, and a significant enlargement of memory capacity based on power-efficient memory technologies. The Virtual Physiological Human (VPH) 24 project aims to provide digital representations of the entire human body, referred to as virtual humans. Instead of focusing on finding a specific cure for a specific disease, the VPH approach is to treat individual patients rather than treating diseases. The virtual humans are based on data collected from real patients, including biological, imaging, clinical and genomic data. As the data is unique to each patient, it will enable academic, clinical and industrial researchers to improve their understanding of human physiology and pathology, to derive predictive hypotheses and simulations, and to develop and test new therapies. The eventual outcome will be better disease diagnosis and treatment, along with improved prevention tools in healthcare. HPC is also a key element of the Science Cloud. The future European Science Cloud is set to create an innovation environment for the data-driven science, requiring novel tools and easier access methods to data and computing resources. The U.S.A. is already moving in this direction. The NSF Jetstream 25 initiative is setting up the first cloud for science and engineering across all research areas supported by NSF, adding cloud-based HPC computation to the national U.S.A. cyber-infrastructure. Researchers will be able to create virtual machines on the remote resource that look and feel like their lab workstation or home machine, but are able to harness thousands of times the computing power. Health, demographic change and wellbeing: new therapies heavily rely on HPC for understanding the nature of disease, discovering new drugs, and customising therapies to the specific needs of a patient. Secure, clean and efficient energy: HPC is a critical tool in developing fusion energy, in designing high performance photovoltaic materials or optimising turbines for electricity production. Smart, green and integrated transport: the management of large traffic flow e.g. in smart cities will require the real time analysis of huge amounts of data in order to provide multivariable decision/data analytics support on your mobile or car. Climate: HPC underpins climate study and prediction, and safety in the extraction of fossil fuels (gas, oil). Food security, sustainable agriculture, marine research and the bio-economy: HPC is used to optimise the production of food and analyse sustainability factors (e.g. weather forecast, plagues and diseases control, etc.). Official Statistics: Current promising efforts to develop EU data analytics services for policy depend to a large extend on utilizing the potential of HPC and Big Data to provide society and policy makers with relevant, accurate and timely statistical information for decision making. Agriculture is the principal means of livelihood in many regions of the developing world, and the future of our world depends on a sustainable agriculture at planetary level. Besides weather prediction and climate change effects, HPC is becoming critical in agricultural activity, plague control, pesticides design and pesticides effects. Climate data are used to understand the impacts on water and agriculture in the Middle East and North Africa region 29 , help local authorities in the management of water and agricultural resources, and assist vulnerable communities in the region through improved drought management and response. Applications enabled by HPC and Clouds are becoming part of agriculture 30 , using for example radio-frequency identification tags (RFIDs) which can hold and automatically download a mass of data on the bale’s moisture content, weight and GPS position. In the future, micro-tags of the size of soil particles will be deployed extensively in fields measuring such things as moisture, disease burden and even whether the crop is ready to harvest or not. Mastering HPC is a question of sovereignty and a strategic priority for the most advanced nations. Strategic societal, scientific and economic needs are the drivers for the next generation exascale systems, requiring in some cases radical approaches (e.g. 300-fold improvement in computing capability while staying at the same power budget). Supremacy in supercomputing technology is not for the sake of having the fastest supercomputer in the world, but to autonomously master a critical technology capable of giving a world leading competitive edge in a vast range of technologies, applications and markets that heavily depend on this game-changing technology. The risk of depending on other regions is being technologically locked, delayed, or deprived of this strategic know-how by our competitors. HPC has become indispensable for supporting policy making, maintaining national sovereignty and economic competitiveness. HPC is strategic from the point of view of sovereignty, supporting the decision-making process in political decisions for energy, home security, or climate change, or in the context of national security applications. Supercomputers are in the first line of the increasingly critical areas of cyber-war and cyber-criminality (in particular industrial espionage), helping to prevent and fight today's sophisticated cyber-attacks and security breaches, insider threats and electronic fraud. The cyber-breach 31 in June 2015 on USA Office of Personnel Management (affecting the data of four million former and current federal employees) supports claims from senior military and intelligence officials that the U.S.A. is under more or less constant Cyber assault –e.g. recent intrusions and data breaches at the Inland Revenue Service, the Department of State and the White House. The scale of concern over the attacks suggest that they are 'far more serious…to national security' than 9/11 (Congresswoman Carolyn Maloney (D-NY)). Mastering HPC technologies, all the way from the hardware and system software to applications, has become a national strategic priority for the most powerful nations including U.S.A., China, Japan, Russia, and India. The immense risk is being technologically locked, delayed or deprived of strategic know-how. The U.S.A. government recently decide to block the exporting of Intel's last generation processors to upgrade some of China's most powerful supercomputers, claiming that the computers were being used for nuclear weapons research. 32 This technology ban limitation is a serious blow to the Chinese race to exascale computing. What this global race is really about is supremacy in supercomputing and in all the disciplines and markets that depend heavily on this game-changing technology. Strategic societal, scientific and economic needs are the drivers for the next generation exascale systems. The much larger and more complex datasets of modern science and engineering drive the increasing need for significantly higher performing technologies. Exascale technologies will bring substantial benefits to application domains that traditionally use HPC, and most importantly, will open up opportunities in new emerging areas and address big challenges that currently cannot be tackled. The aerospace industry has an ever increasing need of more computational power to run simulations for aircraft design, behaviour of components in flight, etc. Advanced computing and visualisation capabilities cut development/run times from months to days. Airbus (one of the leaders in the aerospace industry to use HPC) aims at simulating a whole aircraft, superseding the current ‘piece by piece’ approach and saving millions of euros in design, development and maintenance costs, will require at least exascale performance. The development of exascale technologies is not for the sake of having the fastest supercomputer in the world. The goal is to build "first of a kind" systems rather than "one of a kind". The transition to exascale computing is an opportunity for the European supply industry to introduce Intellectual Property (IP) generated in the EU and in a wide range of technologies in the computing continuum from smart phones to embedded systems to servers, feeding the broader ICT market within a few years of their introduction in high-end HPC –giving a competitive advantage to those developing them at an early stage. Section 4 below discusses how this endeavour could be realised in the European HPC ecosystem. Thus advances made in the area of HPC such as new computational technologies, software, energy efficiency, storage applications, etc. frequently feed into the consumer mass market and become available in households within about 5 years of their introduction in the HPC area (e.g. file systems and optimisations of the LINUX operating system). Conversely, computing components and technologies developed for the mass market (e.g. energy efficient microprocessors) are widely used for the cost-efficient design of HPC systems (e.g. the use of modified PC graphic cards as accelerators in HPC systems). The development of next-generation HPC systems is motivated by very challenging specifications (e.g. for combinations of performance, power consumption and reliability), which serve as drivers for the development of novel technology. In many areas, this can only be done through a revolution rather than an evolution of technology. Exascale computing entails huge challenges, e.g. to efficiently program the millions of cores connected is beyond today's algorithmic capabilities. Regarding power consumption, a simple extrapolation of the HPC technology used in the fastest supercomputers of a couple of years ago would require 20 GW to power and cool an exascale machine, (nearly the peak electrical power generation of the Three Gorges Dam in China, the world's largest hydroelectric power plant of any type). The fastest supercomputer as of November 2015 (Tianhe-2) requires ~18 MW for operating at its maximum performance (between 33 and 54 Petaflops). The total traction power of a Eurostar train is typically around 16 MW. The technology needs to radically evolve to achieve a 300-fold improvement in computing power while staying at the same power budget. Other nations including U.S.A., China, Japan, Russia, and India are racing ahead and have declared HPC an area of strategic priority, creating national programs that are investing large sums of money to develop HPC technology and deploying state-of-the-art exascale supercomputers. The U.S.A. is the world leader in systems and technologies, but China is ramping up HPC spending faster than any other nation or region, fielding the top-world supercomputers, developing indigenous technologies and supporting the creation of world-wide players in the ITC/HPC market. The Obama Administration issued on 29 July 2015 an executive order to establish the National Strategic Computing Initiative (NSCI 34 ) aiming at a multi-agency strategic vision and Federal investment strategy to maximize the benefits of HPC for economic competitiveness and scientific discovery for the United States. The U.S.A. acknowledges at the highest level that investment in HPC has contributed substantially to national economic prosperity and rapidly accelerated scientific discovery, and that creating and deploying technology at the leading edge is vital to advancing the Administration's priorities and spurring innovation. The ExaSCALE Computing Leadership Act of 2015 will create research partnerships between industry, universities and U.S.A. Department of Energy's national labs to research and develop at least two exascale supercomputer architectures, with the goal of having a fully operational computer system that has reached "exascale" – a measure of speed that is beyond any other system in the world – by 2023. In addition, the annual budget of the DoE to the Exascale Computing Initiative is funded to a level of ~€150 million in 2015 for the exascale ecosystem (co-design, software, tools, etc. ), and increasing to ~$270 million in 2016 (and similar levels for the years to follow). American intelligence agency IARPA has launched "Cryogenic Computer Complexity" (C3) program to develop an exascale supercomputer, with "a simplified cooling infrastructure and a greatly reduced footprint." The project has awarded contracts to three major technology companies: International Business Machines, Raytheon BBN Technologies and Northrop Grumman. China is ramping up HPC spending faster than any other nation or region, although increases may slow down. Utilization of Chinese supercomputers is typically much lower than in Europe, the U.S.A., or Japan. China's growth in supercomputer capacity is outpacing the growth of China's HPC user base. More than 85% of China's supercomputers come from U.S.A. vendors today. European HPC system vendors have no strong presence in China. The U.S.A. block on Intel technology exports will accelerate China's initiatives to develop indigenous processors. China's HPC vendors—Lenovo, Inspur, Huawei, and Sugon (Dawning)—are gaining market experience. China has at least five initiatives under way to advance the development of indigenous processors for HPC systems, and some of China's (and the world's) most powerful supercomputers now incorporate Chinese processors. There is a very strong likelihood that the next big machine will be based on the indigenous ShenWei CPU instead of Intel products. The slowing down of China's domestic economy will likely curtail the growth of HPC spending. Japan has twice fielded the world's most powerful supercomputer, most recently (2011) the €400 million, Fujitsu-built K computer at RIKEN. Japan seems intent on competing for HPC performance leadership, but Japan's periodic efforts to deploy the world's number one supercomputer indicate that Japan may not be able to compete on a sustained basis with U.S.A. or Chinese funding levels. Japanese vendors Fujitsu and NEC may soon ramp up their efforts in Europe's comparatively open HPC market. Japan has just concluded the Feasibility Study of Future HPCI (High Performance Computing Infrastructure) systems, launched by MEXT (Ministry of Education, Culture, Sports, Science and Technology). The project spans three systems teams and one application team. The design specifications aim to support the creation of a high-end computing system (near-exascale) in the 2018-2020 timeframe 38 , i.e. the next incarnation of the K machine (fastest system in 2012). This machine is expected to be the country’s first near-exascale system 39 (—in the order of 0.6 exaflops) a $1.38 billion undertaking that’s already underway with expected installation in 2019 and full-steam production in 2020. India has committed 41 about $2 billion dollars (Rs 12,000 crore) to the Indian Space Research Organisation and the Indian Institute of Science to develop a high-performance supercomputer by 2018. India’s government-backed computing agency, C-DAC, also announced a $750 million (Rs 4,500 crore) blueprint to set up 70 supercomputers over the next five years. Member States have their own histories and interests. The European HPC ecosystem is inherently more challenging to organize and collaboratively advance than its single-nation counterparts in the U.S.A., China, and Japan. Until recently, organized HPC initiatives in Europe were largely confined to the national and regional levels, and pan-European HPC collaboration was far more limited. No single Member State has the financial and related means to compete effectively in HPC against the U.S.A. or China—the world's number one and number two national funders of HPC technology development and consumption today. Japan is another nation that is determined to remain a global scientific and industrial leader with the help of HPC. Only by joining efforts can Member States establish an HPC ecosystem with enough critical mass and realize the goal to attain leadership in the supply (production) and use (consumption) of HPC. The HPC Communication highlighted that Europe was falling behind other regions of the world because of its under-investment in establishing a complete HPC ecosystem: to acquire leadership-class computers, secure its own independent HPC system supply, and deploy HPC services to industry and SMEs for simulation, visualisation and prototyping. The underdevelopment of the HPC ecosystem has a double negative effect: there is not enough HPC capacity to cater for the demand by science and industry; and there is also not enough European supply industry that designs and builds HPC systems. As a consequence, research may need to relocate outside Europe, access to advanced systems is insufficient, and software and tools development, especially those linked to hardware, is disadvantaged. Europe of course continues to be an appealing sales market for HPC system vendors from 3rd countries. European HPC software and services are adapted and tuned to these HPC systems and in turn benefit their (non-EU) vendors. The successful formation of a European (complementing national) awareness on HPC, structured by the Commission-led effort to create the first Europe-wide HPC strategy around the HPC Communication. The PRACE 42 partnership, establishing a pan-European HPC infrastructure for scientific and engineering research accessible by all EU researchers through a single review process based on excellence, and the tiered structure for organizing HPC centres at the European (Tier-0) and national levels (Tier-1, Tier-2). The establishment of the European Platform on HPC (ETP4HPC) in 2011 (incorporated as an Association in 2012) and the establishment of the contractual Public-Private Partnership (cPPP) 43 on HPC with the European Commission in Horizon 2020, complementing the efforts started in FP7 to support R&D and other activities towards exascale (e.g. Mont-Blanc, DEEP, CRESTA, EESI, etc.). Pre-Commercial Procurements (PCP) at European level (PRACE-3IP and Human Brain Project) and plans for further procurements for innovation (PPIs) in Horizon 2020 (from 2016). The establishment of the ECSEL Joint Undertaking, 44 aiming to the development of a strong and globally competitive electronics components and systems industry in the European Union. Today, the European HPC ecosystem is a vibrant mix of national, regional and pan-European initiatives, augmented by European participation in international HPC-supported scientific collaborations that extend far beyond Europe—notably the Intergovernmental Panel on Climate Change (IPCC), ITER, and the Square Kilometre Array (SKA) project. The support of HPC is fundamental in several European large projects such as the Large Hadron Collider at CERN (Europe has become the centre of the global ecosystem for particle physics research), and the Human Brain FET flagship initiative (with the potential to establish Europe similarly as the hub of global brain research). HPC is already contributing to advanced research on Graphene, the focus of another EU FET flagship initiative. Technological disruptions that can change the current HPC landscape should be followed closely, in order to spot new opportunities for new technologies developed in Europe - in particular, synergies must be exploited with other IT developments like e.g. micro/nanoelectronics (ECSEL). The European strategy has to take advantage of these strengths and overcome the weaknesses with an approach aimed at technologies with a market potential large enough for a sustainable development, rather than focusing on "one of a kind" machines. The goal is to leverage on technologies in the computing continuum, from smart phones to embedded systems to servers, feeding the broader ICT in the longer run with IP produced in the EU. The key for this approach is the co-design, choosing and developing technologies that really fit the needs of important applications and the users of such technology. This will facilitate the take-up of products and systems based on European IP. Finally, the synergies between HPC, big data and Clouds have to be exploited to create an HPC ecosystem favouring innovation and with economy of scale –for example, creating a favourable environment for SMEs with new access methods to HPC resources, software and tools. The EU has the largest GDP in the world but investments in HPC are much lower than the U.S.A. Europe maintains a relatively constant share of around one-quarter of the overall spending in all categories of HPC systems. For large systems over €360000, the EU share of the global market is forecast to expand to 30.6% in 2018. However, in the strategically important high-end market of systems over €2.25 million , the current situation is not very satisfactory. The EU has only one supercomputer in the top 10 and three in the top 20 (November 2015), dropping from peak 4 and 7 systems respectively in 2012. Spending levels for these high-end supercomputers are an important measure of HPC leadership. On HPC supply, U.S.A. is the absolute world leader, having the lion's share in all segments of the European HPC systems market. The only sizeable Europe-based vendor, Atos (formerly Bull) is under 5%, with a peak market share in 2011. Europe is strong in parallel software development and a global leader in exploiting HPC for innovation. The European share of the worldwide commercial HPC software market closely matches its share of global spending in the HPC server market. Worldwide, the proportion of sites exploiting cloud computing to address parts of their HPC workloads is rising –helping the "democratisation of HPC", especially as advances in virtualization capabilities becoming more efficient and HPC-friendly. The convergence of HPC and big data analytics is being driven by HPC users and the growing contingent of commercial firms that are adopting HPC solutions to tackle data analytics. Worldwide and European HPC server spending dedicated to high performance data analysis (HPDA) will grow robustly (23.5% CAGR) in the period 2013–2018 - more than three times the forecasted growth rate of the worldwide HPC server market. Note: The following data is based in the IDC study.Error! Bookmark not defined. “EU" represents the 28 Member States of the European Union. “EU+” represents the 28 Member States, plus Norway and Switzerland. Figures for the years up to and including 2013 are historical unless specified otherwise. Figures for 2014 and beyond are forecast numbers unless otherwise specified. Finally, the term “revenue” in the titles of the tables is synonymous with spending. The EU now has the largest GDP in the world (€13.2 trillion), having surpassed the GDP of the United States (€12.6 trillion) 45 . However, the U.S.A. has substantially outspent the EU (and EU+) region on HPC server systems 46 and IDC forecasts that this pattern will continue. On the spending (consumption) side, the U.S.A. will continue to handily outspend the EU/EU+ and other global regions at least through 2018 (the end of IDC's current forecast period). The EU/EU+ region has slightly increased the worldwide percentage with respect to the 2009 baseline (from 24-26% to 25-27% in 2013) and has outspent and will continue to handily outspend China and every global region other than the U.S.A. through 2018. Hence, where the entire HPC server market is concerned (all price points), Europe has maintained, and is forecast to maintain, relatively constant share of slightly more than one-quarter of global spending. IDC does not foresee these spending patterns changing markedly by the year 2020. The EU/EU+ market share evolution has been much stronger in the segment of the HPC server market that is more important for scientific and industrial computing leadership—supercomputers priced at over €360000. In this strategic segment, the EU/EU+ share of the global market grew robustly from 21.8-23.0% in 2009 to 27.1-28.5% in 2013 and are forecast to expand to 30.6-31.8% in 2018. Supercomputers sold for €2.25 million and up are the most important class for advanced scientific and engineering work. These supercomputers are a high-end subset of the overall Supercomputers category discussed in the prior section. Spending levels for these high-end supercomputers are therefore also an important measure of HPC leadership. When considering these findings, it is important to note that spending in this small but strategically important high-end market can vary greatly from year to year, because it is driven by a small number of large financial transactions that are subject to non-annual, cyclical renewals. The EU has only one supercomputer in the top 10 and three in the top 20 (November 2015), dropping from a peak 4 and 7 systems in 2012. Spending increased substantially in the EU/EU+ for large supercomputers from 2009 to 2012 thanks mainly to the PRACE procurements (112 million euros in 2009, to 658 million in 2012), but then declined (down to 362 million euros in 2014). In the period 2009-2014, worldwide spending on large supercomputers grew by 25.9% to reach €1.2 billion. Growth for specific regions often varied greatly from year to year. 2012 was an atypically strong year, owing especially to several major new installations in Europe, China and Japan, the largest of which (Japan's K supercomputer and China's Tianhe 2 system) alone added €400 million and €237 million in spending, respectively. Regarding the HPC overall budget (server systems, storage, middleware, applications software, and service), computer hardware remains the largest item in the HPC budget. During the period 2009-2013, European spendingError! Bookmark not defined. for the HPC ecosystem grew 24.4%, from 3.07 in 2009 to reach €3.8 billion, or 26.1% of the worldwide HPC ecosystem spending (€14.6 billion). Spending on HPC servers represented 49.8% of that total. IDC forecasts that European HPC ecosystem spending will increase by 37.8% (6.6% CAGR) to reach about €5.2 billion in 2018, or 24.9% of worldwide HPC ecosystem spending (€21.3 billion). U.S.A. vendors represented 89.6% of all European (EU+) HPC server system revenue/spending in 2009 and 81.2% in 2014. The only sizeable Europe-based vendor, Atos (formerly Bull), accounted for 1.7% of spending in 2009 and 2.0% in 2014. In its largest revenue year during this period, 2011, however, Atos/Bull captured 9.7% of European HPC server system revenue. U.S.A. HPC system vendors have the lion's share of the European market today, but Atos' acquisition of Bull may create a stronger competitor for U.S.A. (and other non-European) HPC vendors over a longer period. Market share for U.S.A. vendors declined slightly from 95.0% in 2009 to 93.2% in 2014 in the more strategic supercomputer category (HPC systems sold for €360000 or more). IBM and HP were the strong leaders in this segment. Atos/Bull market share grew slightly from 4.2% in 2009 to 4.5% in 2014, but had a peak of 18.6% market share in 2011. Regarding the strategic category of high-end supercomputers (sold for €2.25 million or more) during the historical period 2009-2014, U.S.A. vendors captured 86.9% of European revenue in this category in 2009 and 96.7% in 2013 (the most recent year for which IDC had European revenue figures for this category). In 2009, revenue for IBM alone accounted for 66.7% of European revenues, while Atos/Bull had a 4.58%. In 2014, combined revenue for IBM and HP represented 58.9% of European revenue. Cray had an exceptionally strong 2014 in Europe and accounted for 39.2% of revenue in this high-end category. In 2011, Atos/Bull had an exceptional year and captured 20.3% of European high-end supercomputer revenue, while in 2013 it reduced to 3.33%. For the five-year forecast period 2013-2018, IDC predicts that the strongest growth will occur in computer-aided engineering (CAE), which is heavily used in the manufacturing sector. Other predicted fast-growth areas including weather/climate (7.6%), government labs/centres (7.6% CAGR), chemical engineering (7.2% CAGR), academia (7.0% CAGR) and geosciences (6.9% CAGR). Geosciences use today is primarily related to "upstream" oil and gas exploration and will secondarily for alternative energy research. The largest segments for EU HPC spending in 2018 will be, sequentially, government labs/centres, academia, CAE, bio-sciences, and geosciences. Europe is already strong in important areas of parallel software development, and a global leader in this area of the supporting Computer Science; some of Europe's best firms are ahead of their international competitors in exploiting HPC for innovation. The worldwide commercial market for HPC softwareError! Bookmark not defined. was worth €4.4 billion in 2013. IDC estimates that the European portion of global spending in this market closely matched Europe's portion of global spending in the HPC server market (~27%) and was therefore worth roughly €1.2 billion in 2013. IDC forecasts that the worldwide HPC software market will expand to about €6.4 billion in 2018 and European spending in this market will be about €1.7 billion. Companies such as Allinea (UK), Bright Computing (Netherlands), Dassault Systèmes (France), Schrödinger (Germany), and others have demonstrated that European software vendors can achieve notable success in both the European and global HPC markets. IDC estimates that European independent software vendors (ISVs) today represent 15-20% of the global HPC market for ISV software, and 25-30% of the European market. The vast majority (83%) of the most important parallel software applications in use at the surveyed European HPC sites were created in Europe. Intellectual property rights for a substantial majority of the sites' most important application codes (66%) were exclusively owned by European organizations. But many of these important codes are used only by one or a handful of HPC sites. Europe has a number of globally successful scientific and engineering software firms, a larger number of nationally and regionally successful software firms, and is strong in many important areas of parallel software development. In addition, great strides have been made within initiatives such as CRNS, INRIA, Germany's Special Programme on Exascale Computing, and others, as well as within large industrial firms such as Daimler, EDF, Airbus, and quite a few others. Where extreme-scale software is concerned, however, Europe (like the rest of the world) has been overly focused on funding parallel hardware to the detriment of parallel software, and on "big science" in comparison with industry. Where funding has been made available for parallel software development, the funding typically has been for only a year or two, compared with at least 5-10 years of funding needed to develop robust, production-quality software that can remain useful for 10-20 or even 30 years and across multiple generations of HPC hardware systems. Worldwide, the proportion of sites exploiting cloud computing to address parts of their HPC workloads rose 48 from 13.8% in 2011 to 23.5% in 2013, with public and private cloud use about equally represented among the 2013 sites. Although European cloud use for HPC was not always separable—some clouds are multi-continental or worldwide—it was clear that the percentages in Europe closely matched global counterparts. IDC believes that HPC cloud use could double in 2015 from a modest base, especially as advances in virtualization capabilities becoming more efficient and HPC-friendly. IDC research indicates that currently, HPC usage within public clouds are still best suited for highly parallelized workloads, and accordingly, such workload use is seeing some of the fastest growth rates within the cloud especially from new or first time commercial HPC users. However, there will be a growing emphasis within the cloud service sector to target the HPC user base looking to solve more traditional modelling and simulations problems that are not as easily parallelized, and. as a result, IDC expects to see even more cloud centres offering dedicated HPC hardware. Currently, the particulars for pricing models for these new HPC-centric cloud systems are in flux. The EU has an overall plan for general-purpose cloud computing 49 . To move forwards, EU HPC leadership should embrace cloud-based HPC as an integral element in any HPC-related program, both for so-called capacity computing and for capability computing (as public clouds evolve sufficiently to support more capability computing). Cloud-base access, by its very nature, offers the ability for EU HPC leadership to acquire and provision flexible, on-demand HPC cycles to a wide range of potential users from government, academia, and industry, in a relatively low cost environment –helping the "democratisation of HPC". Such capabilities will be especially important for potential new users and SMEs that are not wholly committed to or technically capable of justifying an in-house HPC capability, and that can benefit from easy-to-use, on-demand Cloud-access HPC services and pay as they use them. Another important new area for the European HPC ecosystem is high performance data analysis (HPDA). HPDA is a term to describe the convergence of the established data-intensive HPC market and the high-end commercial analytics market that is starting to move up to HPC resources. The HPDA market represents the convergence of long-standing, data-intensive modelling and simulation methods in the HPC industry/application segments, and newer high performance analytics methods that are increasingly employed in these segments as well as by commercial organizations that are adopting HPC for the first time. HPDA may employ either long-standing numerical methods, newer methods such as large-scale graph analytics, semantic technologies, and knowledge discovery algorithms, or some combination of long-standing and newer methods. HPC is used for advanced data analytics to spot patterns in hour-by-hour weather observations and domestic fight data to help airlines manage more efficiently the scheduling 50 . Data may be used to build computer modelling software that could predict the outcome of an infinite number of hypothetical flight and weather scenarios, helping airlines spot likely weather delays in advance. That knowledge could enable airlines to adjust their schedules to account for weather patterns. It may also lead to better communication with travellers and a less stressful flight experience. IDC estimated the percentage of worldwide and European HPC server spending dedicated to high performance data analysis (HPDA), that is, HPC servers purchased primarily to run data-intensive simulation or analytics workloads. IDC forecasts that worldwide revenue for HPDA servers will grow robustly (23.5% CAGR) during the period 2013–2018, increasing from €672 million to about €1.9 billion in 2018. This is more than three times the IDC-forecasted growth rate of the worldwide HPC server market as a whole. Europe's share of this HPC-related market is similar to Europe's share of the HPC server system market as a whole, about one-quarter of the global total. HPDA requirements are increasing in many scientific domains and are driving more commercial companies, including SMEs, to exploit HPC technology for the first time. 67% of the HPC sites said48 they use HPC systems for HPDA, and that HPDA use consumes 30% of their HPC cycles on average. The same study found that 23.5% of the HPC sites were using cloud computing to address parts of their HPC workloads rose, with public and private cloud use about equally represented among the sites. Within the HPC ranks, HPDA is already becoming mission critical in the government, academic, manufacturing, energy, weather/climate, life sciences, and digital content creation markets — not to mention high frequency trading as an important addition to existing HPC-driven financial services applications. Many commercial firms have moved up to HPC for the first time for advanced business analytics/business intelligence, fraud/error/anomaly detection, real-time affinity marketing, and other applications. Even though the existing HPC solutions they use may not be explicitly designed to excel at data analytics, it is not unusual for these firms to save $10 million or more per year from upgrading to HPC sold for a fraction of that amount. The Communication on HPC called on Member States, industry and the scientific communities, in cooperation with the Commission, to step up joint efforts to ensure European leadership in the supply and use of HPC systems and services by 2020. (a)The fragmentation of public HPC services across the EU and within Member States. (b)The substantial underspending (compared to other regions) on acquiring high-end computing systems (only half compared to the U.S.A., at a similar level of GDP47). (d)The difficulty for European HPC vendors to sell their products to the public sector in non-EU countries that have national HPC vendors. (e)The limited interaction between industry and academia on the exploitation of high-end computing systems, application codes and services, especially regarding the use of HPC for industrial and service innovation. It also reflected the lack of advanced experimental high-end computation facilities for industry and academia to explore exascale technology options or co-design hardware and software for specific applications. (f)The limited workforce with the adequate educational background and well trained in HPC especially in parallel programming and the lack of attractive career paths for scientists that look after the computational tools and application codes. Ensure the EU's position as a global actor. An independent study was carried out by IDC during 2014 and 2015 to provide an assessment on the progress on the implementation of the European HPC StrategyError! Bookmark not defined.. The study found that overall in the past 5 years there's been a growing realization of the importance of HPC for the competitiveness of European science and industry. The same thing has been happening at the national level, including the value of collaborating with other countries. Three-quarters (75.7%) of the European HPC stakeholders participating in the study —a group including scientific and industrial end-users—believe that Europe's overall HPC capabilities have gotten stronger in the past 2-3 years. No one thinks that the overall capabilities have gotten weaker during this period. Europe has made impressive progress in areas that are crucial for the goals of the Action Plan, especially organizing the European HPC community to pursue HPC leadership on a unified basis, expanding the scientific and industrial access and use of supercomputers, and launching initiatives to strengthen the European HPC supply chain. Today, the EU has a European-wide HPC awareness, a Europe-wide scheme for categorizing HPC centres, a single peer-review process for accessing Tier-0 supercomputers, a substantially larger number of the world's top 50 supercomputers, improved access for industry of all sizes (including SMEs), and a significant initiative (the cPPP on HPC) to advance indigenous HPC technologies and applications, among other achievements. Overall, the coordination of the different initiatives related to the European HPC strategy has worked well, but more needs to be done. At the very high end of the supercomputers segment, Europe has significantly narrowed the former gap separating the most capable U.S.A. and Japanese supercomputers from their European counterparts. In November 2010, shortly after the founding of PRACE, 9 of the world's 50 most powerful supercomputers 53 were located in Europe. In November 2015, the EU hosted 15 of the top 50, including the PRACE Tier-0 supercomputers. The aggregate peak performance of the EU-based supercomputers rose more than ten-fold during this period, from 3.77 petaflops in November 2010 to 45 petaflops in November 2015. Clearly, Europe's standing as a provider of high-end supercomputing resources advanced in both absolute and relative (worldwide) terms during the period 2010-2015. However, the EU is losing its position in the top supercomputing league, with only one supercomputer in the top 10 and three in the top 20 (November 2015), dropping from a peak 4 and 7 systems in 2012. The PRACE peer review system has enabled fair access to leading supercomputer by scientists, and more recently industrial engineers, from throughout Europe. However, greater outreach is needed to industry, especially SMEs. European HPC investments are producing excellent returns-on-investment (ROI) for science and industry. Based on information from 143 European HPC projects, for projects that generated financial returns, each euro invested in HPC on average returned €867 in increased revenue/income and €69 in profits. 143 European HPC projects were included in the IDC study, of which 84 produced innovations and 59 produced quantifiable financial returns. The largest average ROI gains per €1 invested in HPC were reported by financial services firms (€1590), transportation firms (€1180), and oil/gas companies (€312). Academic projects averaged €30 in cost savings per €1 invested in HPC, and industrial projects averaged €75 in bottom-line profits or costs savings per €1 of HPC investment. Total increased revenue for the 59 HPC-enabled, quantifiable projects was €133.1 billion, or about €230 million per project on average. Average increased profits/cost savings for all the projects amounted to €69 billion. Europe achieved healthy public sector HPC funding growth in 2010, 2011 and 2012, but Europe-wide funding declined heavily in 2013 and 2014. On average, the net funding increase over the last five-year period was extremely good for pursuing HPC leadership. However, the EU is losing its position in the top supercomputing league, and significant investments will be needed for pre-exascale systems and exascale systems in the period 2019-2022. To achieve the goal of HPC leadership —meaning at minimum parity in HPC capabilities with the best in the world, with Europe standing as number one in the world in certain targeted areas of using HPC —Europe needs to acquire at least one exascale supercomputer in the same timeframe as the U.S.A., Japan and China (estimated in 2022). Member States and the European Commission should find a way to pool resources to amass the huge funding needed for the exascale supercomputers. However, the use of joint PCP and PPI for HPC in Europe has remained very marginal. There is a substantial R&I programme in place (structured around the cPPP on HPC) to take advantage of the European technical capabilities and human skills needed to tackle the exascale challenge, i.e. to develop native capabilities that cover the whole technology spectrum from processor architectures to applications. There are particular strengths in applications, low-power computing, systems and integration that can be leveraged to engage successfully in this global race, getting the EU back on the world scene as a leading-edge technology supplier. The protective barriers in the U.S.A., Japanese and Chinese HPC markets for European HPC suppliers are still in place –by contrast, the EU is the most open market both for commercial and government procurements. These market asymmetries should be addressed at a government-to-government level, preferably by the European Commission. There is still a shortage of qualified HPC job applicants. HPC competency is rarely required in university scientific and engineering curricula in Europe. Students should be made aware from an early age of attractive, rewarding HPC careers. PRACE has been instrumental in the successful establishment of a world-class HPC infrastructure in Europe. PRACE initiatives to provide European industry with access are showing initial success, but there is a need for greater outreach to industry. A bigger effort is needed to reduce the current fragmentation of the computing and data infrastructures in Europe in Europe. The important trend of convergence of HPC, Big Data and Clouds, and the increasing costs of building and maintaining communication, computing and data infrastructures requires a stronger governance at European level and the rationalisation of HPC resources as an integral part of the innovation infrastructure of the future European Science Cloud. Growth in HPC supply and use is increasingly limited by the shortage of qualified personnel, and current efforts in providing HPC skills (PRACE is a particularly active player) are not sufficient – especially in light of the challenges needed to harness the potential of petascale and exascale computers. The first specific objective "Provide a world-class European HPC infrastructure, benefitting a broad range of academic and industry users, and especially SMEs, including a workforce well trained in HPC" has shown a strong progress in purchasing, installing and putting into use large HPC systems across Europe. In the period 2010-2014, Member States funded Tier-0, Tier-1 and Tier-2 systems at a very healthy level: Europe's overall HPC capabilities in the most powerful supercomputers, and largely through the PRACE program, Europe has narrowed the former wide gap detected in 2009 separating the most capable U.S.A. and Japanese supercomputers (and now Chinese) from their European counterparts. European Commission supported and keeps supporting the implementation of PRACE (for activities such the peer review system, training, seminars, and some prototyping procurements including a PCP). Strong investment progress was also made in two primary research areas that rely substantially on HPC, for example in the Human Brain Project (HPB). However, in HPC there is no European-level coordination of the HPC policies of Member States. A bigger effort is needed to reduce the current fragmentation of the computing and data infrastructures in Europe. The important trend of convergence of HPC, Big Data and Clouds, and the increasing costs of building and maintaining communication, computing and data infrastructures (sometimes duplicating the efforts and resources), requires a stronger governance at European level and the rationalisation of HPC resources (coordinating and federating the existing HPC resources Tier-0, Tier-1 and Tier-2) as an integral part of the innovation infrastructure of the future European Science Cloud. Following the creation of the PRACE legal entity in 2010 (for a period ending in mid-2015), four Member States pooled some of their academic leadership-class computing systems as a single infrastructure and made them available to all researchers in the EU. Critical mass is achieved and access to these top-of-the-range HPC systems is provided on the basis of scientific excellence rather than the geographical location of a researcher. PRACE is further extending its services to mid-range HPC systems with the objective of providing a distributed computing platform that serves its users irrespective of their location and the availability of national resources. The PRACE model of pooling and sharing systems and expertise makes optimal use of the limited resources available. For the PRACE 1.0 period (2010 – mid 2015), the four hosting members—Spain (BCS), Germany (GCS), France (GENCI) and Italy (CINECA) each pledged to contribute €100 million, for a total pledge of €400 million. Some of the commitment involves not cash investment in acquiring supercomputers, but in-kind contributions, such as supercomputing cycles, operating expenses and personnel time. As of today, three of the four hosting members have been given extensions until early 2016 to complete the full amounts of their PRACE 1.0 commitments. The actual total contributions to date from the hosting members can be estimated in the range of €250 million to €300 million. Discussions are being held by Member States for a possible extension of PRACE into "PRACE 2.0". However, the level of funding or the financing scheme for PRACE 2.0 has not been settled yet at this moment in time (an agreement is expected in the first quarter of 2016). The PRACE project partners received in FP7 EC funding under the PRACE Preparatory and Implementation Phase Projects (PRACE-1IP (2010-2012), PRACE-2IP (2011-2013), PRACE-3IP (2012-2014)) for a total of €67 million, complemented by the consortium budget of over €43 million. 57 The EC funds covered activities such as the peer-review process for access to PRACE supercomputers, training, prototyping, application tuning and a helpdesk. PRACE supercomputing power has allowed astounding scientific advances in Europe. An international team led by the Max Planck Institute for Astrophysics in Garching (Germany), used a PRACE-allocation of 20 million core hours on the French Tier-0 system CURIE to simulate the entire known Universe from its birth to present day, including the “web” of spiral and disc-galaxies 59 . The results of this research were published on 7 May 2014 in edition #509 of Nature. In the field of medicine and life-sciences, a project led by University College London used 25 million core hours on the German Tier-0 SuperMUC to understand how the protein involved in cell division (kinase) is activated 60 , opening the door to future cancer treatments by regulating this activation with tailor-made drugs. The simulation of free energy methods and the running of multiple replicas on hundreds of processors are so complex that can only by carried out by a system with petascale performance. European high-end supercomputers are regularly oversubscribed—the demand for computing cycles typically exceeds the supply by a factor of two to three. It is therefore safe to assume that the 10-fold increase in capacity among Europe's largest supercomputers in the last 5 years is almost fully utilized today (this is confirmed by utilization data reported by the centres hosting these supercomputers). The use of PRACE supercomputers has also been substantially democratized through the single peer review process that makes access available on an equitable basis to scientists from throughout Europe. PRACE initiatives to provide European industry with access are newer and are showing initial success, but there is a need for greater outreach to industry. HPC advances for scientific progress, industrial competitiveness, national security, and the quality of human life, are unattainable without an adequate number of properly trained personnel, including computational scientists, programmers, system administrators, technologists and all the others who help make up the HPC ecosystem. Growth in HPC supply and use is increasingly limited by the shortage of qualified personnel. There is a world-wide serious shortage of qualified candidates for HPC positions today 61 , and Europe is no exception. 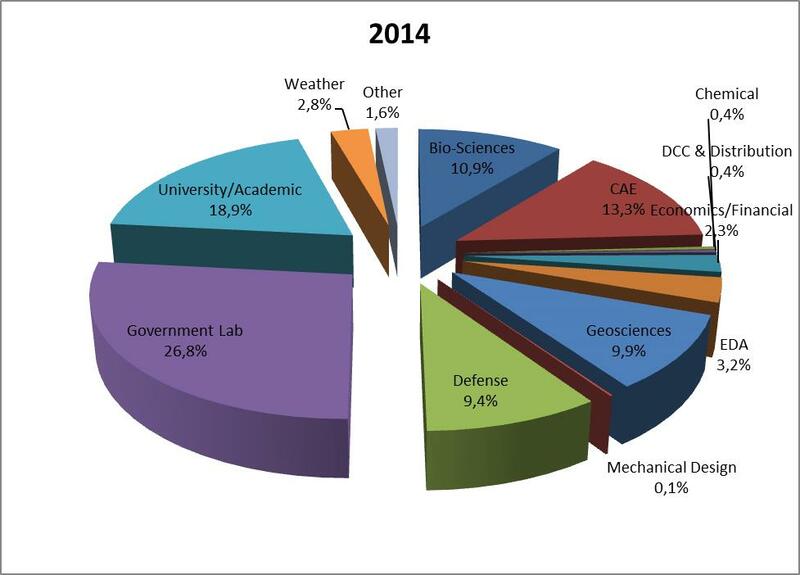 The number of university programs in computational science and related fields plummeted during the late 90's, as did HPC-related internship and postgraduate fellowship opportunities. Young people who might have chosen an HPC career a decade earlier all too often opted instead for employment with "new technology" Internet, PC or gaming companies. As a result, a high proportion of today's "greying" HPC workforce is within a decade of retirement age and educational institutions are not producing enough HPC-trained graduates to replace them. The HPC community has only begun to address this labour shortage through new curricular and internship offerings, as well as through accelerated on-the-job training, but there is still a long way to go – especially in light of the challenges needed to harness the potential of petascale and exascale computers. The job categories that HPC centres consider hardest to find are scientists with HPC capabilities, parallel programmers, algorithm developers, and system administrator with high-end computing experience. The skills most badly needed today include a combined understanding of a scientific discipline and computational science and/or computer science; parallel programming and code optimisation, especially for scaling to large processor/core counts; algorithm development; and understanding of parallel file systems. At European level, one of the most outstanding achievements of PRACE is the PRACE training activities (PRACE training events and the PRACE Advanced Training Centres (PATCs)). The PRACE Training Portal 62 is a complete entry point to promoting training opportunities with very wide information on courses and leading-class tutorials and training material. ~5000 people have been trained by the PRACE Advanced Training Centres and other events. There is an increasing trend in all types of scientific production supported by PRACE: 158 PhD theses, 507 publications and 719 scientific talks supported, and two patents filed from PRACE-supported projects. Europe cannot be a mere buyer dependent on other regions to access the key HPC technology and infrastructure to innovate. HPC's ability to boost scientific, industrial and economic competitiveness has led to the conclusion in the leading world nations that this transformational technology is too strategic to be outsourced to foreign sources. Europe's interest in fostering the development of an indigenous HPC supply chain is part of this global trend. The EU, building on its base of existing and planned EU-wide HPC development programs, is positioned to manage and coordinate a strong base of both indigenous and foreign technology across its commercial and government sectors to assemble exascale HPC capability that could, in some critical application sectors achieve world-class, if not global leadership, status. Mastering HPC state-of-the-art technologies, not only from the use point of view, but from the development of the whole know-how chain from hardware, software, tools and applications, is recognised as a strategic factor for the nations engaged in the worldwide race towards exascale computing. If Europe is a mere buyer dependent on other regions to access the key computing technology and infrastructure to innovate, the immense risk is being technologically locked or deprived of strategic know-how. For example, the ban on Intel last generation processors to China (decided by the U.S.A. government) is a serious blow to the Chinese race to exascale computing – but has accelerated the Chinese programme for indigenous processors. Europe's interest in fostering the development of an indigenous HPC supply chain is part of a global trend. The growing recognition of HPC's ability to boost scientific, industrial and economic competitiveness has increasingly led to the conclusion that this transformational technology is too strategic to be outsourced to foreign sources. The trend scarcely applies to the U.S.A., which has long had large domestic HPC suppliers that dominate the global market. But in other major geographies, such as Europe, Japan, China and India, the push is on to develop strong indigenous HPC supply chains in order to decrease reliance on foreign sources, especially the U.S.A. Even Japan's leading supercomputers, aimed mainly at the Japanese market, employ indigenous RISC processors and other domestic technologies. -In 2013, about 110,000 HPC systems were sold around the world and more than 90% of these systems came from U.S.A. suppliers. In the same year, more than 90% of the processors and co-processors powering HPC systems also came from U.S.A. suppliers. -China today has at least five indigenous processor development initiatives under way, most famously the evolving Loongson processor series developed under the auspices of the Chinese Academy of Sciences (CAS). -Japan's most powerful HPC system, the K Computer, is based on custom SPARC processors from Fujitsu and NEC continues to develop custom vector processors. -In April 2014, the Russian state-sponsored electronics company Ruseelectronics 63 announced that it is developing a petascale supercomputer and "all of its processors and components will be designed in Russia." There is therefore a clear need to provide for a European world-class industrial supply capability. Europe has all the technical capabilities and human skills needed to tackle the exascale challenge, i.e. to develop native capabilities that cover the whole technology spectrum from processor architectures to applications 64 . Even though the EU is currently weak in terms of HPC system vendors compared to the U.S.A., there are particular strengths in applications, low-power computing, systems and integration that can be leveraged to engage successfully in this global race, getting the EU back on the world scene as a leading-edge technology supplier. The situation in the European HPC supply landscape has significantly changed since the establishment of the European Technology Platform for HPC (ETP4HPC) 65 in 2011 (incorporated as an Association in 2012). ETP4HPC is an association of European suppliers and dedicated to advancing European HPC technologies and Europe's HPC supply chain. The European Commission has established a cPPP on HPC in partnership with the ETP4HPC's, with €700 million of EC contribution pledged in Horizon 2020 and matching funds from the private side. ETP4HPC has defined "European supplier" as any supplier that performs R&D in Europe, no matter where in the world the supplier is headquartered. This definition allows European scientists and engineers, as well as Europe-based suppliers, to benefit from R&D collaborations that may also involve suppliers not based in Europe. Using synergies with other IT market technologies. Ultimately the EU, building on its base of existing and planned EU-wide HPC development programs, is positioned to manage and coordinate a strong base of both indigenous and foreign technology across its commercial and government sectors to assemble exascale HPC capability that could, in some critical application sectors achieve world-class, if not global leadership, status. Hardware (processors, storage, interconnects): the market situation has not significantly changed since 2009 regarding hardware, i.e. technologies from Europe-based suppliers today have a very small share and presence in HPC across Europe. Only 54% of survey respondents believe that Europe's ability to develop HPC hardware has gotten stronger or stayed about the same. U.S.A. manufacturers (i.e. Intel processors and coprocessors/accelerators from Intel and Nvidia) will continue to dominate the European and global HPC markets for at least the next five years (2020). However, processors based on low-power designs from UK-based ARM Holdings will establish a modest but expanding presence in the market during the period 2015-2020, and progressively ARM designs will be incorporated into the HPC systems of non-European as well as European vendors. On storage, Xyratec (now part of Seagate) is an indigenous HPC storage developer, and Europe has several important innovative interconnect suppliers like EXTOLL (Germany) and Numascale (Norway), and Atos (Bull) is developing a high-capability interconnect. These will compete in the European and global market with the current world leader Mellanox (Israel-U.S.) and interconnects from Intel, among others. European vendors Atos and EXTOLL are positioned to begin capturing interconnect market share over time, starting in the European HPC market. Software: Europe has world-class strengths in highly parallel software. Advances in parallel software will become even more important than e.g. hardware performance for the coming era of exascale computing. Software is considered as one of the most critical aspects, because the ability to exploit future-generation (including exascale) supercomputers for science and industry will depend heavily on software capabilities. This is because the capabilities of the hardware systems have gotten far ahead of the ability of software to exploit them efficiently (or of interconnects to keep processors busy with data). Today, only about 1% of HPC application codes can exploit 10,000 or more processor cores. Yet, the largest HPC hardware systems today contain more than 1 million cores, and exascale supercomputers with tens or hundreds of millions of cores will begin to arrive during the period 2020-2022. A substantial majority of European respondents to the IDC study consistently stated that developing software is a demonstrated strength of Europe's HPC community. 54.0% believe Europe's ability to develop HPC software has become ""somewhat stronger (45.9%) or "much stronger" (8.1%). 35.1% think that this ability has "stayed about the same." Only 8.1% believe that Europe has gotten "somewhat weaker" in developing HPC software. The vast majority (83%) of the most important parallel software applications in use at the surveyed European HPC sites were created in Europe47. Intellectual property rights for a substantial majority of the sites' most important application codes (66%) were exclusively owned by European organizations. But many of these important codes are used only by one or a handful of HPC sites. Hence, there is a major opportunity for commercialization and further dissemination of parallel software codes already in use in Europe. The de-emphasizing of funding for exascale software development by the U.S.A. government has created an opportunity for Europe to gain an important advantage in the global race. Some European software companies are highly successful in Europe and across the world, but their number is small. EU-based companies, including Dassault Systemes, Bright Computing, Allinea and others, have had notable success in selling their software products into the European and worldwide HPC markets, including the U.S.A. The size and maturity of the U.S.A. HPC market, along with tax and market access considerations, often motivate European software firms to establish dual headquarters in Europe and the U.S. The importance of pooling and optimising European investments in world-class HPC infrastructure under PRACE is well recognised. The establishment of PRACE was a first step in the right direction, however it has not yet provided the adequate governance for the necessary European-level coordination of the HPC policies of Member States. In a wider context, the current governance of European e-infrastructures (including HPC) is not suitable to tackle the emerging trend of the HPC, Big Data and Cloud convergence and the growing needs to coordinate and federate at European level the different e-infrastructures as part of a European Science Cloud, matching the needs of the researchers and research infrastructures. The achievement of the European HPC leadership requires adequate governance for setting concrete objectives, deciding policies, monitoring progress and efficiently pooling and using resources available across the Member States. The development of HPC has long been a national affair for Member States, often driven by military and nuclear energy applications. The increasing importance of HPC for researchers and industry, as well as the exponential rise in the investments required to stay competitive at world level, have led to a common understanding that ‘Europeanisation’ of this domain would benefit everyone. This is also true for those Member States which encounter difficulties in creating self-sufficient national HPC infrastructures whereas they can make valuable contributions to and benefit from EU-level HPC capabilities. The European Commission has advanced the HPC strategy by coordinating with the efforts of multiple initiatives and stakeholders, including the Member States through PRACE, and ETP4HPC. The importance of pooling and optimising European investments in world-class HPC infrastructure under PRACE has been recognised by the Council54, inviting the Member States and the Commission to exchange and to share priorities and plans for HPC development, in association with PRACE and the European Technology Platform on HPC2. The establishment of PRACE has not however provided the adequate governance for the necessary the European-level coordination of the HPC policies of Member States. The need for an EU-level policy is increasingly accepted, an in the May 2015 Competitiveness Council, ESFRI (European Strategic Forum on Research Infrastructures) was invited to explore mechanisms for better coordination of Member States' investment strategies in e-infrastructures, including HPC56. The current governance of European e-infrastructures (including HPC) is not suitable to tackle the emerging trend of the HPC, Big Data and Cloud convergence and the growing needs to coordinate and federate at European level the different e-infrastructures (e.g. HPC, distributed computing, data) as part of an European Science Cloud, matching the needs of the researchers and research infrastructures (e.g. in terms of data production). No single Member State will have the financial resources to acquire exascale computing capabilities and develop the necessary HPC ecosystem on its own in the same time frame as the U.S.A., Japan or China. Instruments to pool and coordinate resources from different Member States are still underutilised in Europe today. The global economies investing in HPC will gain the greatest competitive advantage and reap the largest economic benefits. No single Member State will have the financial resources to reach the exascale generation on its own in the same time frame as the U.S.A., Japan or China, i.e. acquiring exascale capabilities and developing the necessary HPC ecosystem. As outlined in the HPC Communication, pooling of resources at EU level is needed. However, regarding the pooling of resources, there is no central procurement agent in Europe with the financial ability and motivation to exploit Pre-commercial procurement (PCP), public procurement of innovative solutions (PPI) or related mechanisms on behalf of Europe in a coordinated way, as needed to compete at the same level with U.S.A., China and Japan. The cost of buying one machine in the highest performance range is currently estimated in the order of €100 – €150 million. In addition, to ensure independent access to state-of-the-art HPC technologies, a minimum of €50-100 million per year are needed for just the system development of one exascale machine. This figure will ramp-up if the operation costs, the ecosystem of developers and the effort to exascale the codes and applications in use by industry and academia are taken into account. Similarly to the situation detected in 2009, PCP and PPI are still underutilised in Europe today. PCP and PPI are key mechanisms used by the governments of the United States, China and Japan (Europe's main rivals for HPC leadership) to drive commercial competitive advantage and to advance suppliers of indigenous technologies. Member States conduct procurements, but with rare exceptions they have not used PCP and PPI mechanisms in the HPC domain. The Commission has encouraged and supported a limited number of HPC procurements gathering procurers from different Member States using PCP or PPI, such as the PRACE-3IP €9 million PCP for a joint procurement and joint ownership of innovative HPC prototypes, focusing on high-energy efficiency HPC systems, and the Human Brain Project €2.6 million PCP for system components allowing interactive visualization and steering of large-scale brain simulations on high-performance architectures. Member States are concerned primarily with their national needs and do not closely coordinate or pool financing for their supercomputer procurements. Hence, the status quo will make it exceedingly difficult for Europe to amass enough money to acquire pre-scale and exascale supercomputers in competitive timeframes. The current PRACE agreement ended in mid-2015 (although it has been provisionally extended), and discussions are being held by Member States for a possible extension into "PRACE 2.0". However, the level of funding or the financing scheme for PRACE 2.0 has not been settled yet at this moment in time. The anticipated costs for acquiring and operating pre-exascale and exascale supercomputers will require substantially higher funding levels than in PRACE 1.0. The European Commission has supported the implementation of the European HPC strategy through several activities in FP7 and Horizon 2020. In FP7, the EC contributed €67 million to the PRACE Preparatory and Implementation Phase Projects, and nearly €50 million more in support of the technology development projects towards exascale (e.g. Mont-Blanc, DEEP, CRESTA) and accompanying measures (EESI and EESI2) for the definition of the exascale software roadmap. In the frame of the ICT Innovation for Manufacturing SMEs (I4MS) initiative, €27 million supported the Fortissimo, Cloud flow and Cloud SME projects. Advancing the development of autonomous technology and strengthening Europe's HPC supply chain: Under the FET WP2014-15, the EC committed €93.4 million to support the development of core technologies and an additional €4 million for ecosystem development. Additional €85 million are budgeted in the FET WP2016-2017, covering the whole spectrum from processors and system architectures to software stack, programming models, algorithms etc. European excellence in HPC applications: The EC committed €40 million for Centres of Excellence (CoE) and €2 million for a Network of HPC competence centres for SMEs under the e-infrastructure programme in 2014-2015.
o8 Centres of Excellence were launched in 2015 for the application of HPC in scientific or industrial domains that are most important for Europe. The Centres of Excellence will have the critical task to help Europe to advance in Europe's existing leadership in HPC applications. The CoEs cover important areas like renewable energy, materials modelling and design, molecular and atomic modelling, weather and climate change, Global System science, and bio-molecular research, and tools to improve HPC applications performance. oCoEs should further consolidate the EU’s strong position in HPC applications by coordinating and stimulating parallel software code development and scaling, and by ensuring the availability of quality HPC software to academic and industrial users. Another challenge for CoEs to address is the skills gap in computational science: Centres of Excellence are key to develop skills and expertise needed for the coming era of exascale computing. PRACE has been instrumental to pool national and EU resources and it is the reference at European level for specifying the needs of the top-range supercomputers. PRACE made its services available to the entire European research and education community, and provided training and expertise in HCP (mainly to academic research but also to some industry). This is expected to continue in PRACE 2.0 (expected agreement in first quarter 2016), although the financial, legal and organisational details have not been disclosed; it is unlikely that PRACE will significantly extend its role, e.g. to carry out joint (pre-commercial) procurement for leadership-class systems or to provide research and innovation services and training to industry in a large scale –the usage of the cycles in the PRACE systems are subject to several constraints for wide industrial use. The fourth implementation phase of PRACE received €15 million in 2015, and €15 million more are budgeted in the Work Programme 2016-2017. The EC has also committed €26 million in 2016-2017 to support a Public Procurement for Innovative solutions (PPI) for advanced (sub)systems to be used in the frame of PRACE. €2 million have been allocated for EU-Brazil collaboration on HPC in the LEIT Workprogramme 2014-15. For science, through PRACE and centres of excellence addressing key societal and scientific challenges by deployment and application of HPC software and services. The governance in HPC has considerably evolved in the last few years, creating a real awareness of the importance of HPC for Europe and of the need to setting concrete objectives, deciding policies, monitoring progress and efficiently pooling and using resources available at EU-level, in particular with the establishment of PRACE in 2010 and the European Technology Platform for HPC (ETP4HPC) in 2011. ETP4HPC gathers mainly suppliers of HPC technology, but also research organisations and universities, and supercomputer centres active in PRACE. PRACE has also an observer role in the platform, ensuring a constant communication channel between the two organisations. The ETP4HPC has achieved enormous progress in a short time with the production of the Vision paper 68 and the Strategic Research Agenda (2012), 69 and later with the establishment of the cPPP on HPC in 2014. ETP4HPC has been developing more or less formal and/or technical links with a number of initiatives, other organisations or cPPPs, infrastructures or large projects, such as PRACE; BigDataValue cPPP; 5G cPPP; SKA, the Square Kilometre Array; ELIXIR –actually an ETP4HPC member; EESI; ECSEL; HiPEAC; HBP; and Photonics21. achieving excellence in HPC applications. to develop an EU leadership and world-wide excellence in key application domains for industry, science and society. • Supporting the generation of young talent as a crucial element of the development of European HPC. The structuring of the EU-level governance in HPC is going beyond the HPC Communication recommendation to EU Industry engaged in supply of HPC systems and services "to coordinate research agendas through the technology platform and thereby create critical mass of industrial R&D in HPC". 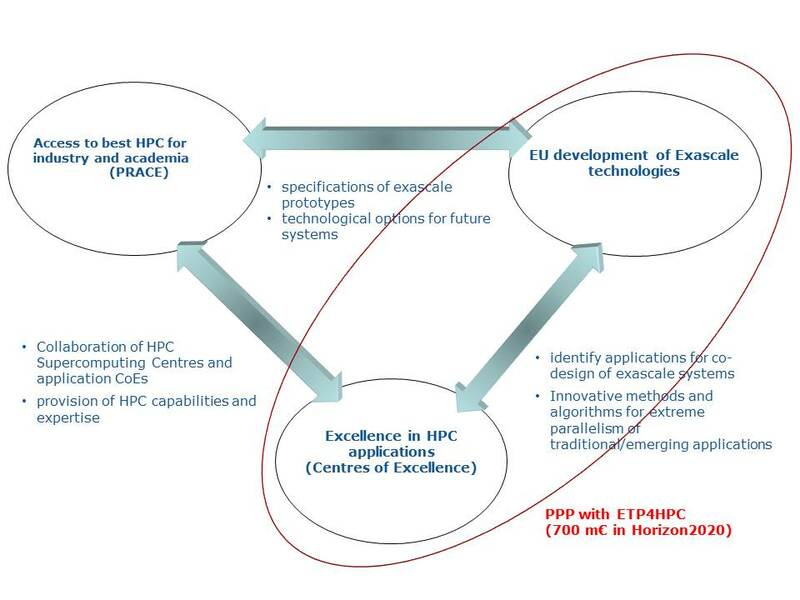 EXDCI will contribute to the synergetic implementation of the three axes of the European HPC strategy (HPC Infrastructure, HPC Technology Provision, and HPC Application Resources) by putting in place tools for strategic review and definition for all the three axes, and by setting up a process for the creation of relevant roadmaps and the review of project results in the three axes. It is expected that EXDCI will also contribute to a better outreach and communication of the European HPC strategy, making sure that Member States and key members of the HPC community in Europe are aware of the EU HPC plans and activities. The future European Science Cloud requires new tools and access methods to resources in order to create an innovation environment for the data-driven science that is easier to access and use (e.g. easier cloud-based integrated access to HPC resources including PRACE, Tier-1, Tier-2, etc.). A longer-term step in strategy is to engage in a discussion process with PRACE and the other actors (e.g. other e-infrastructures and research infrastructures stakeholders, including ESFRI) to integrate HPC in the innovation environment of the European Science Cloud. Further efforts should support the evolution of PRACE towards a sustainable globally leading e-Infrastructure and a key component of the European Science Cloud, through the coordination of the different resources at national and European level to match the needs of the researchers and research infrastructures. The increase in 2009 investment levels recommended in the HPC Communication (some additional €600 million 71 per year to bring Europe back as a major actor in the field of HPC) has not been evenly distributed in the last few years. Although the European spending in the overall HPC market (including servers, software, storage, services, etc.) grew 24.4% in the period 2009-2013, the European expenditure in strategic supercomputers (systems sold over 360 k€) increased from €715 million in 2010 to reach the peak of more than €1 billion in 2012, but falling to €780 million in 2013 and €660 million in 2014. Due to the increasing strategic importance of HPC and the race to exascale computing, competing regions (in particular the public/government sector) have significantly increased the spending in HPC. The overall European-wide investments on HPC (public and private) including R&D, supercomputer purchases, and related services in 2010 amounted to approximately €1.8 billionError! Bookmark not defined.. However, the current growth of European investment in HPC will not be enough to attain and maintain leadership, meaning at minimum parity with best-in-class HPC resources in the U.S.A., Japan, or China. Significant investments will especially be needed for pre-exascale systems in the period 2019-2020 and exascale systems as of 2022, and the accompanying development of the HPC ecosystem. Note that all these countries have extended the exascale horizon from 2020 as initially estimated to 2022, following the most recent timeframe estimates. U.S.A. government spending on HPC will exceed €1.5 billion in fiscal year 2015 and will be more than €1.7 billion in fiscal year 2016. (These figures do not count HPC spending by the U.S.A. intelligence community). Current plans foresee at least three pre-exascale systems in 2017-2019 and exascale systems in 2022. Japan has set aside a $1.38 billion undertaking for one near-exascale computer in 2020. The estimationsError! Bookmark not defined. of public and private investments for Europe to achieve leadership by 2020 are €3.263 billion in 5 years (2016 to 2020) or €5.271 billion in 7 years (2016 to 2022) in order to match the developments of Europe's main competitors for HPC leadership in competitive time frames. These amounts entail an increase with respect to current investments in the order of additional €500 million to €750 million per year (roughly in the same order of the recommendations in the HPC Communication). For the calculations of the total investments in 5 or 7 years, the following assumptions have been taken: the lower figure for leadership (€500 million increase per year) with a 5% yearly increase, a total cost (purchase and operation) of a pre-exascale system of €250 million, a total the cost of a exascale system of €350 million, and a similar effort to the U.S.A. in terms of number of systems (i.e. two pre-exascale systems around 2019-2020 and two exascale systems around 2022). A lesser minimal HPC funding level (i.e. increase of €250 million per year) would allow Europe to at best stay close to its current level, but most likely to fall behind somewhat within 3 to 4 years. At this level there still need to be major investments in software and applications, and exascale system purchases are still critical, but they would happen about 1.5 years after the first exascale systems show up elsewhere in the world, and even then systems in Europe may be perhaps only half-exascale in size. It is clear that this huge amount of investments require a strong coordination of the different national HPC policies and the European strategy. The U.S.A., Japan, and China have mechanisms to promote innovation in leadership supercomputing while providing advantages to national suppliers over competing nations and global regions. Procurements are in most cases restricted to national players, while there are no such restrictions in European procurements. No clear strategy has been agreed yet at European level for pooling resources to amass the huge resources needed to finance the acquisition of pre-exascale supercomputers around 2020 and exascale supercomputers in 2022. The next step in the European HPC strategy is to put in place a coordinated strategy with mechanisms for transitioning the European set of leading machines to the new computing generation. The HPC Communication relied on the fact that the public sector is the mayor buyer of high-end HCP, and invited Member States to carry out joint procurements and the use of Pre-Commercial Procurement (PCP) to stimulate the development of advanced HPC systems and services (devoting around 10% of the annual HPC procurement budget to it). The idea was to support HPC suppliers for developing a leadership-class HPC system about every 2 years. However, the use of PCP in Europe has not lived to these expectations. The governments of the United States, Japan, and China have similar mechanisms to the PCP and PPI to promote innovation in leadership supercomputing, i.e., innovation that provides advantages to national suppliers over competing nations and global regions. Major national procurements that have incorporated these mechanisms include the Tianhe-1a supercomputer (China), the K supercomputer (Japan), and the CORAL procurements (United States). These procurements are in most cases restricted to national players, and have resulted in contracts between a national government and a domestic supercomputer maker, benefiting both the government buyers and the domestic HPC industry. The PCP and PPI in the European environment however do not apply such restrictions. In general terms, these instruments are used today only occasionally in Europe for HPC. The main reasons for this are the newness of supercomputer procurements that include EU-wide goals and the paucity of Europe-based supercomputer vendors and other suppliers. Another reason (applicable to any world region) is that the assumed benefit to the supplier may not be realized, for example, if the government buyer's pre-commercial requirements are so specific ("one-off") that they do not adequately address the needs of the commercial market 74 - and this has been the case for some large HPC procurements, mainly in the U.S.A. At European level, only two PCPs are currently being carried out (in the PRACE-3IP project and in the Human Brain Project flagship), but with limited budget and scope. Collaboration mechanisms for supercomputer acquisitions that leverage R&D collaborations have been established, e.g. CEA and Bull (Atos) for several systems, the SuperMUC system at the Leibniz Rechenzentrum (LRZ), the "Hornet" supercomputer acquisition by HLRS, and the Human Brain Project sponsored by the European Commission. In addition, no clear strategy has been agreed yet at European level for pooling resources to amass the huge resources needed to finance the acquisition of pre-exascale supercomputers around 2020 and exascale supercomputers in 2022: this is critical for Europe to remain competitive with the U.S.A., China and Japan. Pooling resources to acquire exascale supercomputers in globally competitive time frames require that the adequate governance structures are in place to facilitate coordination of national and European HPC policies. A first step direction in this has been taken in this sense, with the PPI on HPC in the e-infrastructure WP2016-2017, but again with a limited budget. The next step in the European HPC strategy is to put in place a coordinated strategy with mechanisms (including PPI) for transitioning the European set of leading machines to the new computing generation. The overall objective of the European HPC strategy "ensuring European leadership in the supply and use of HPC systems and services by 2020" can be interpreted as Europe having a HPC ecosystem that is on a par with the best in the world, and that Europe aims to be number one in the world in targeted aspects of HPC. The HPC Communication outlined a number of measures for the development of the HPC ecosystem, ensuring the coordination of technology developers and suppliers, users and procurers. This requires a synergetic implementation of the three axes of the HPC strategy, ensuring the coordination of technology suppliers and the users and procurers for the definition on exascale requirements, including industrial requirements, and support and accelerate the development of pre-competitive, innovative HPC technologies and systems towards exascale that respond to the user needs. Section 6 above details the concrete efforts supported by the EC in developing this ecosystem. As indicated in the HPC Communication, an integration and co-design effort is needed to gather the players in the HPC ecosystem and focus on the advancement of technologies, HPC resources, tools and methodologies. Co-design in HPC is necessary as the needs of science and industry will best be served if new hardware and software are designed and developed in close coordination with each other, rather than separately (as has often happened). Technological advances produced in isolation require several years of development of the necessary software and application environment. In a highly competitive environment, this delay is not acceptable. DEEP - Dynamical Exascale Entry Platform- is developing a novel, exascale-enabling supercomputing platform with lower energy consumption (water cooling with a more than 200x efficiency improvement over comparable air-cooled systems) but with a monitoring system of unprecedented accuracy and granularity relating application activity to energy consumption, which helps users optimize and tune their system according to their needs. DEEP is suitable for a wide range of codes with either limited or high scalability requirements, thanks to its heterogeneous architecture, with a programming model and a dedicated development and runtime environment which makes porting applications easy. Coordinated acquisition strategy. In cooperation with PRACE, the platform integration will be complemented with procurement/acquisition of pre- and exascale systems for transitioning the European set of leading machines to the new computing generation (the U.S.A. Department of Energy plans for acquiring pre-exascale systems in fiscal years 2016 through 2022 and an initial exascale system in 2023-2024). The EU strategy needs to ensure that all stakeholders in an exascale ecosystem can participate in such integration and co-design activities. The EXDCI support action is a first step in this coordination. This will require ETP4HPC to collaborate closely with PRACE, CoEs and other users to ensure that the ETP4HPC roadmap for indigenous technology development reflects the technology and system-level innovations required by end-users and procurers, and to test hardware and software technologies at large scale in the appropriate environments. The aims are to accelerate HPC innovations by European suppliers and to increase the likelihood that these innovations will be incorporated into supercomputer procurements that enable the European technologies to mature in real-world customer environments. Such an effort will also provide the opportunity to enrich the long-term European exascale technology roadmap, allowing HPC players to understand the overall vision of the EU HPC leadership program and where they fit in. Finally, the development of the HPC ecosystem requires the joint effort of the supply and demand sides, with the aim of best matching the real needs of HPC users. The realisation of Europe as a world-leading innovation hub requires the new world-class computing capability to be easier to access and use in a wider European framework. This action is complementary to the actions points developed under "Governance" above. The HPC Communication stressed the importance of the dual role of Industry in high-end computing: firstly, supplying systems, technologies and software services for HPC; and secondly, using HPC to innovate in products, processes and services. Both are important in making Europe more competitive, and the Action Plan advocates for a dual approach: strengthening both the industrial demand and supply of HPC. The Communication encouraged EU HPC Industry to strengthen its efforts to ensure an independent and state-of-the-art EU supply of key HPC technology. The establishment of the ETP4HPC in 2011 was a turning point for the HPC supply in Europe. ETP4HPC defines "European supplier" as any supplier that performs R&D in Europe, no matter where in the world the supplier has the headquarters. This allows European scientists and engineers, as well as Europe-based suppliers, to benefit from R&D collaborations that also involve suppliers not based in Europe. It is especially important that European suppliers (again using ETP4HPC's definition) not only participate in exascale technology innovation, but also gain experience and feedback in real-world HPC customer environments. As developed in the previous section of this document, ETP4HPC roadmaps for indigenous technology development need to be closely linked to industrial user needs (requiring a strong collaboration with the user industry) and to the requirements driving supercomputer procurements (requiring a close collaboration with HPC procurers in Member States (PRACE)). On the industrial use, and as illustrated in previous sections of this document, access to HPC, modelling, simulation, product prototyping services and consulting is very important (and in some areas critical) to remain competitive. Thanks in part to its expanding use in industry and commerce, during the past two decades HPC has been one of the fastest-growing IT markets, expanding from €1.5 billion in 1990 to more than €15 billion in 2013. Industrial firms typically cannot justify acquiring leadership supercomputers, but industrial firms of all sizes can have computing problems that are just as challenging as major scientific computing problems. To advance European economic competitiveness, it is therefore important to enable industry to access supercomputing resources that the companies lack, especially because the problems requiring these resources are typically mission-critical. In this sense, the Action Plan stressed the importance of for industry to be given increased access to HPC resources at PRACE Tier-0 centres as well as at national and regional HPC centres in Europe. Considerable progress has happened in the last few years. Several Member States continued or set up new HPC competence centres that facilitate access of industry and specifically SMEs to HPC services, with supercomputing centres giving support and transfer expertise to them. Some of these centres are world's leaders in collaboration with industry. These models of industrial collaborations in Member States include HLRS (Stuttgart), Teratec (Paris), SURFsara (Amsterdam), CINECA (Bologna), LRZ (Munich), Hartree Centre (Daresbury), to name a few. Europe, like the rest of the world, also has many HPC centres that have recently added industrial outreach programs and are struggling with how to work with industry. Centres with strong industrial experience are well positioned to mentor less-experienced centres, and to assume leadership roles in any future HPC competence centres. It is very important to fully exploit the existing competency of the HPC centres with the experience of industrial collaboration for any future plans for new competence centres. The PRACE Industry Access allows European companies access to world-class HPC resources and services. PRACE opened access to industrial users in January 2012 and has provided around 309 million CPU hours on Tier-0 supercomputers to more than fifty companies with. Twice-yearly calls offer qualifying companies free access to PRACE resources (including training), with an Open R&D business model, i.e. industrial users may only use the facilities and services provided by the infrastructure for basic research and development purposes, with the condition for the industrial user to publish all results obtained at the end of the grant period. SHAPE (SME HPC Adoption Programme in Europe) is a pan-European PRACE-based programme supporting HPC adoption by SMEs. SHAPE aims to raise awareness and equip European SMEs with the expertise necessary to take advantage of the innovation possibilities opened up by HPC, increasing thus their competitiveness. Fortissimo enables European manufacturing SMEs to benefit from the increased efficiency and competitive advantage offered by simulation. However, SMEs don't have the pool of skills and resources to access advanced simulation (e.g. expensive HPC equipment, licensing cost of tools, etc.). Fortissimo provides simulation services running on a cloud infrastructure exploiting HPC systems and making appropriate skills and tools available in a distributed, internet-based cloud environment. However, a much bigger effort is needed to reach out to potential industrial users at national and European level, in terms of communicating the possibilities of HPC, the HPC strategy, and available initiatives and resources to a broader industrial community interested in HPC -only a small percentage of European SMEs that could be helped by HPC seem aware of these opportunities. This reaching-out should be accompanied with extra efforts to provide the necessary capacities to satisfy the growing industrial needs. In addition, existing programs tend to award access on the same basis that is used for science—peer-review to determine the scientific merit of projects. There are few or no mechanisms for letting industrial organisations and in particular SMEs that are new to HPC gain limited, initial access by for example trying HPC without cost, and with perspective of bringing value to their business rather than showing scientific merit. In particular regarding SMEs, easy (and locally close) access to HPC resources, services, and even more important, skills, guidance and consultancy in HPC are not available in-house. In this sense, and as suggested in the HPC Communication Action Plan, the EC has set up the SESAME-NET 78 network of HPC competence centres, bringing together a diverse mix of established national centres of excellence and regional HPC centres across Europe, SESAME-NET will promote access to computational facilities, pool expertise and resources across Europe and share best practice in HPC industrial use, raising awareness of the benefits of HPC and contributing to the implementation of the European HPC Strategy. Software will be one of the main determinants of future HPC leadership and Europe is very strong in parallel software development. Currently there is no mechanism at European level to help in this sense, but the HPC Centres of Excellence will function as incubators for collaborations involving users and software developers from European HPC user sites and vendors. The "democratisation" of HPC resources, taking advantage of the new opportunities offered by the convergence of HPC, Big Data and Cloud for wide spreading HPC use, like platforms for on-demand HPC-empowered Cloud services for science and industry. These platforms can make possible, facilitating access to the new generation of Big Data tools and services such as high performance data analytics to SME’s , start up’s and company departments (for example on a pay-per-use model), and for the researchers in the European Science Cloud, providing HPC computational resources in a cloud-based platform (in a similar way that the national U.S.A. cyber-infrastructure Jetstream25 to the NSF researchers). A European Cloud could for example make possible a partnership between scientific data providers (e.g. ESA, Meteorological Offices) and the private supporting the overall infrastructure costs in exchange for first mover access. Support the easier access for industrial user of HPC applications and codes, or "cloudification of HPC applications", e.g. by establishing software/tool libraries "clearinghouses" to help disseminate innovative European HPC software that is now in limited use to a much broader industrial base (including Open Source for free use or in cooperation with ISVs -independent software vendors- for pay-per-use). This mechanism should provide access to the developers of the software, including the necessary technical support. It should also include a payment mechanism for paid software and, where appropriate, for paid use of HPC cycles at the centres where the software was developed. However, and despite the important effort deployed by PRACE as described in previous sections, a much wider effort is still needed. CoEs are still too early to deliver in its potential for developing skills and expertise needed for the coming era of exascale computing. The HPC talent pool needs to be grown and the image of HPC as career choice needs to be campaigned at all levels. While thousands of well-paying HPC jobs go unfilled, many talented young people are struggling today to find jobs in their technical fields after completing university education. More effort is needed to acquaint students and faculty, with the exciting opportunities available in HPC, starting well before the students enter universities. Exploiting the HPC opportunities in science and industry requires creating more HPC-related internships and post-doctoral opportunities, as well as guidelines for HPC on-the-job training. Because HPC-based modelling and simulation has firmly established itself as the third branch of scientific inquiry, alongside theory and experimentation, HPC should be as much a part of scientific education curricula. But there is widespread recognition of the difficulty of adding new elements to already crowded science and engineering university curricula. There are no practical strategies for integrating HPC education and training more fully into the scientific and engineering curricula of European universities. This can only be done by universities expanding curricula in computational science – as opposed to mere computer science – and integrating computational science methods into the requirements for science degrees, certainly at the graduate level and preferably also at the undergraduate level. The next steps in the strategy will be to promote HPC in academic curricula and skill development from a multidisciplinary point of view (i.e. actions that intertwines both the computational and the domain-specific aspects), and to explore new training programmes that exploit the combination of a wider base of Web-programming skills (with respect to the much scarcer HPC/parallel programming skills) with cloud-based access to HPC resources. Europe is the most open major HPC market in the world. European HPC system vendors face asymmetries in major HPC markets outside of Europe. These asymmetries for free and fair trade should be addressed on a government-to-government basis, but so far the main competitors have not changed their policies in this respect. The HPC Communication highlighted that in order to develop an autonomous and viable industrial capability in leadership-class HPC, the EU needs to ensure that its HPC industry has fair access to the worldwide markets in the same way that industry from other world regions has access to the EU’s internal market; and that European R&D investments in the HPC field benefit clearly the EU economy. -China's fast-growing HPC market has been dominated historically by U.S.A. supercomputer vendors. More recently, the Chinese government directed investment banks and other "critical infrastructure" sites to cease acquiring non-Chinese HPC systems. Lenovo's purchase of IBM's x86-based HPC product line positions Lenovo to capture or retain these accounts. Europe has had no HPC server vendors large enough to compete with America's HP, IBM, and Dell, or Japan's NEC and Fujitsu, or China's Lenovo (following the acquisition of IBM's x86-based HPC server business). As a result, U.S.A. vendors represented 89.6% of all European HPC server system revenue/spending in 2009 and 81.2% in 2014. The only sizeable Europe-based vendor, Atos (formerly Bull), accounted for only 1.7% of European HPC server spending in 2009 and 2.0% in 2014. The acquisition of Bull may position France-based Atos to compete more successfully against these non-European vendors in the European and worldwide HPC markets. It is also important to note that Europe today accounts for only about one-quarter of the worldwide market for HPC hardware systems and parallel software. This means that Europe-based HPC vendors generally cannot thrive and continually fund world-class innovation unless they can match the investments of competitors who have fair and open access to the larger worldwide market. Regarding Intellectual Property Rights (IPR) that are generated in the area of HPC with Horizon 2020 support, the Commission has not applied additional exploitation obligations, as the organisations participating in the R&I activities prefer to stay within the standard IPR rules of the programme. Council of the European Union, 24 May 2013, Doc.9808/13, Council conclusions on the Communication from the Commission on "High Performance Computing: Europe's place in a Global Race"
e-Infrastructure Leadership Council. "UK Participation in HPC at the European Level." June 25, 2012. European Commission, "Policy-Related Frequently Asked Questions on PCP and PPI." European Commission technical briefing report. Industrial Revolution Brings Industry Back to Europe. 2012. Gartner, Inc., "Predicts 2015: The Internet of Things." IDC (International Data Corporation) study for the EC "High Performance Computing (HPC) in the EU: progress on the implementation of the European HPC Strategy"
IDC Worldwide Study of HPC End-User Sites. 2013. The Parliament Magazine, "European Manufacturing a Powerful Engine for Growth." September 28, 2014. U.S.A. Department of Energy, "Preliminary Conceptual Design for an Exascale Computing Initiative"
IDC study "A Strategic Agenda for European Leadership in Supercomputing: HPC 2020"
HPC Speeds Innovation for Suppliers and Other SMBs. IDC white paper. November 2014. "Will U.S.A. Hurricane Forecasting Models Catch Up To Europe's?" National Geographic. October 27, 2013. IDC Study "Financing a Software Infrastructure for Highly Parallelised Codes"
COM(2007) 799, Pre-commercial Procurement: Driving innovation to ensure sustainable high quality public services in Europe: "The U.S.A. public sector is spending $ 50Bn per year in procurement of R&D, an amount which is 20 times higher than in Europe"
A Study of the Talent and Skill Set Issues Impacting HPC Data Centers. IDC worldwide study conducted for the U.S.A. Department of Energy. July 2010. Survey of the ASC Program's Effectiveness in Stimulating HPC Innovation. IDC special study for the U.S.A. Department of Energy/National Nuclear Security Administration. 2008. U.S.A. Department of Energy, " Preliminary Conceptual Design for An Exascale Computing Initiative"